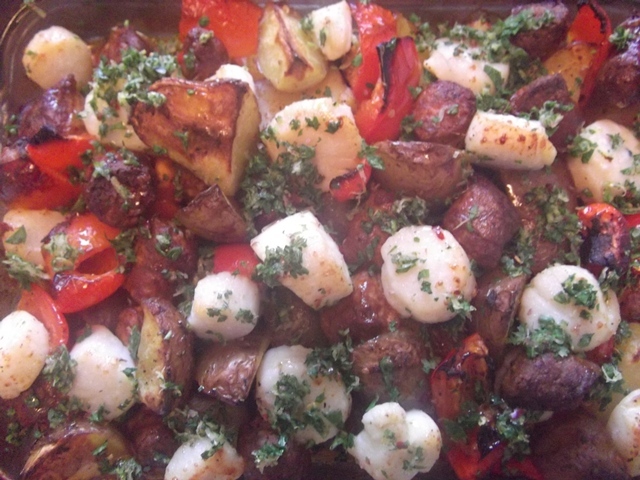 Potatoes with chorizo, scallops, and gremolata. 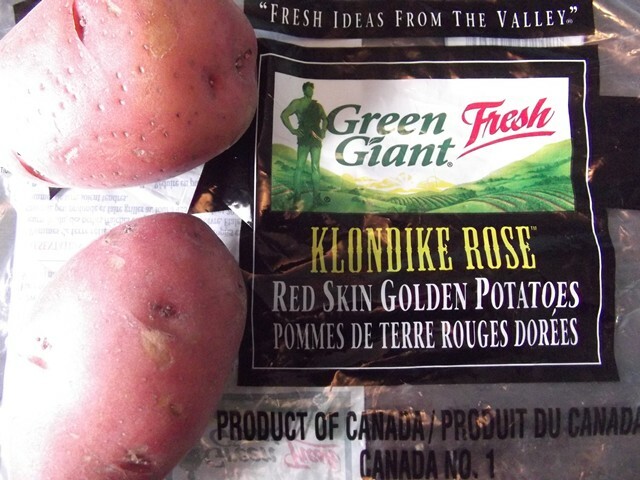 I was asked by a company called EarthFresh, a Canadian potato company, to create a recipe for these pink and gold potatoes, and for it I got the groceries paid for. Which perhaps will become obvious to you when you see that I’ve created a recipe that uses a pound of scallops even though I am still unemployed. Maybe disclosure is redundant then? Anyway, the recipe will go into a contest and if I win I get a second gift card for even more groceries, which will come in handy should the search for work drag on. As a main dish, I’ll admit this one’s a little weird. But bear with me – the sweetness of the potatoes is matched by the sweetness of the roasted garlic and the scallops, and balanced by the lemon juice and the spiciness of the pepper flakes, paprika, and chorizo. While here they act almost like pasta, sopping up the dish’s flavourful juices, often potatoes are a secondary ingredient, a thing that rounds out a meatier dinner. I don’t know why that is, as on more than one occasion while I was a student I would eat a plate of buttery, cheesy mashed potatoes for supper and they were more than satisfying, but most often potatoes suffer silently at the side, relegated to the role of “lead starch.” We are told to enjoy them in moderation, and advised to eat them deep-fried less often. Waxier potatoes, and in particular the golden varieties of potatoes, are not so bad for you. They score lower on the glycemic index, which means that Nick with his diabetes can eat more of them than the fluffy Russet kind as they aren’t so quick to spike his blood sugar levels. Even if he couldn’t eat a whole plate of them, golden potatoes also make for a more interesting mash. I used larger scallops for this, about 15 to 20 to a pound. If all you can get is the cute little baby scallops, cook them for less time – I’d guess 10 minutes. I used two pounds of potatoes, about four potatoes to a pound which parboiled in about 15 minutes – if you have larger or smaller potatoes, adjust your cooking time. If you decide not to use scallops, cubes of a firm-fleshed white fish, whole button mushrooms, or diced zucchini would work well instead. 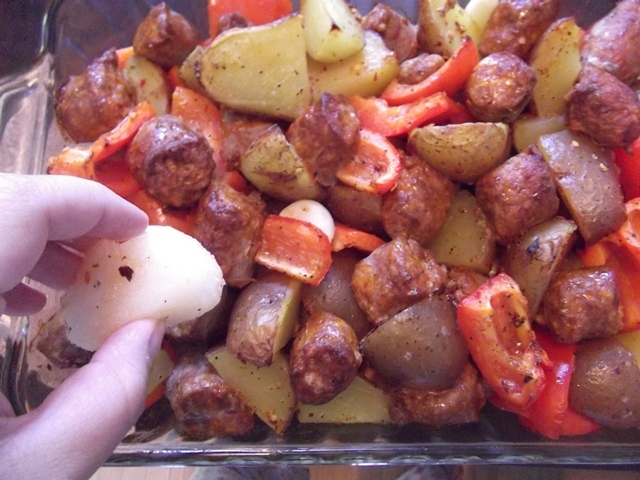 When I tested this recipe I used a 9″x13″ baking dish, which worked fine, but the next time I make this I am going to use a roasting pan as I felt the potatoes could sop up even more flavour if they weren’t as densely packed. Use what you’ve got, though – a 9″x13″ baking dish won’t ruin dinner. Parboil whole potatoes until just fork-tender, about 15 minutes. Drain and chop into quarters or eighths, to about an inch thick. 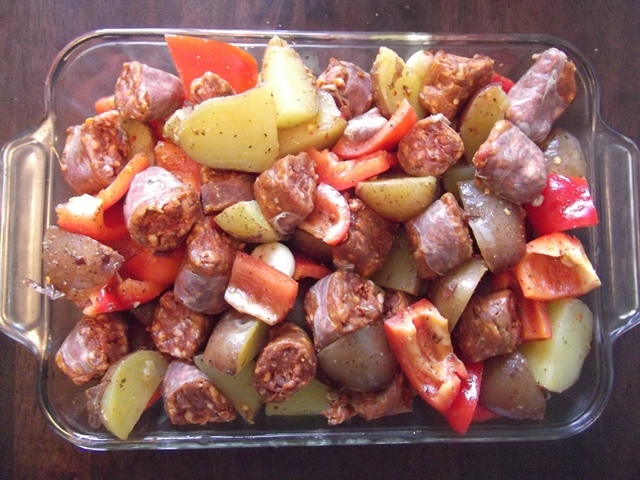 Toss into a bowl with raw chopped chorizo, bell peppers, and garlic cloves. In a smaller bowl, whisk olive oil, lemon juice, one teaspoon of salt, pepper flakes, smoked paprika, black pepper, and oregano. Pour over potato mixture and toss to coat. 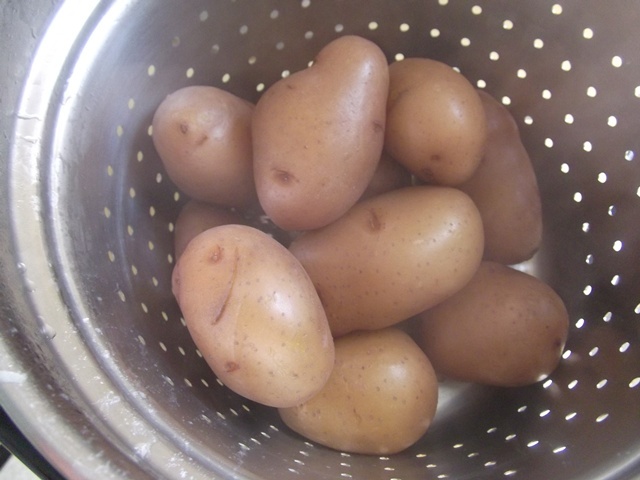 Pour the dressed potato mixture into a baking dish or roasting pan and bake for 20 minutes. Using the same bowl you tossed your potatoes in (don’t rinse it! 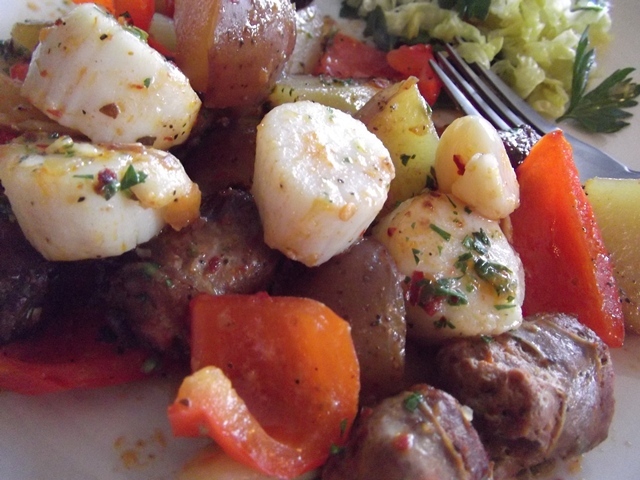 ), toss your scallops with the remaining 1/2 teaspoon of salt. 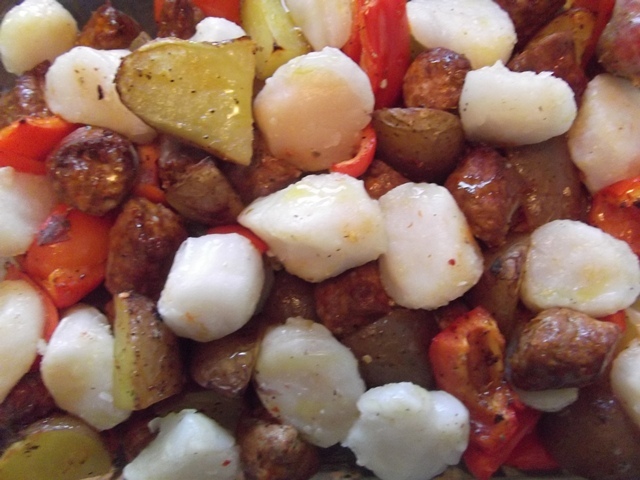 After 20 minutes, pull the dish out of the oven and carefully nestle the scallops in with the potatoes and sausage. 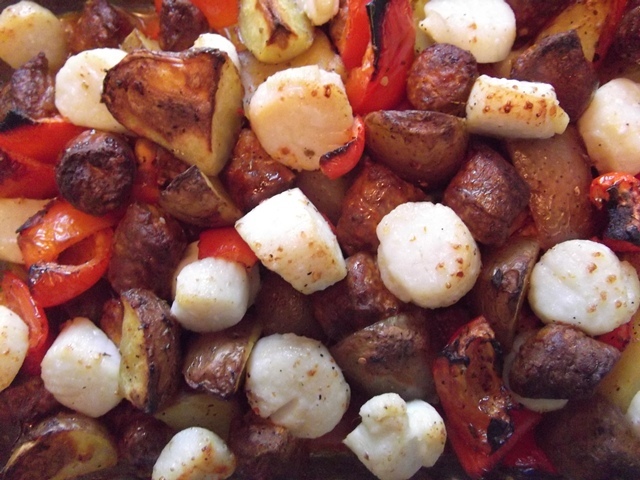 Cook for an additional 20 to 25 minutes, until potatoes have browned and scallops have turned lightly golden. Meanwhile, place parlsey, garlic, lemon zest, and salt in a pile on your cutting board and chop everything finely. Really mince the hell out of it. 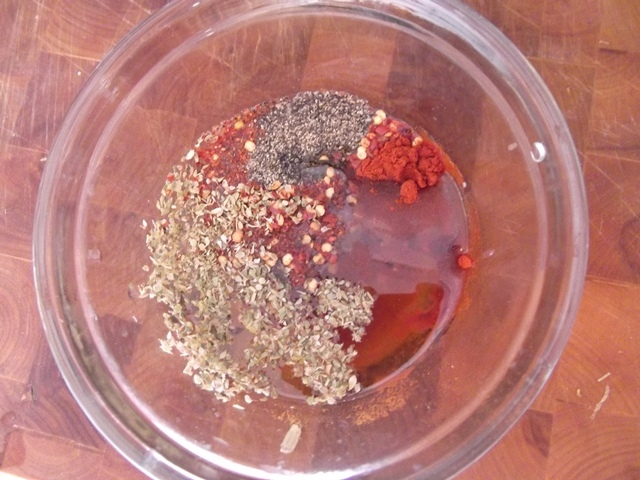 Throw it into a bowl and mix with the red pepper flakes. When your dish has finished baking, pull it out and sprinkle with the parsley mixture. Drizzle with a bit of extra virgin olive oil and serve hot, with crusty bread for sopping and a salad to make you feel virtuous. Next > Picnics and bacon-wrapped garlic scapes. Holy crow that looks good. scallops are unreasonably expensive (sigh, but so delicious), so I’ll probably use bream, which is local and free if I fix some for the person who caught it. 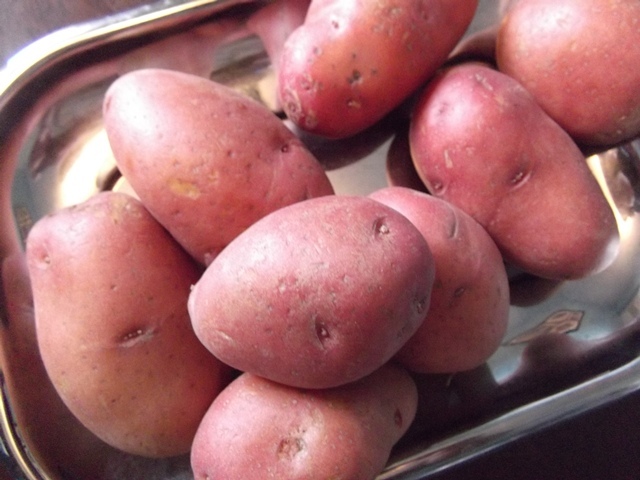 and little red new potatoes…wow that looks delicious. Thanks, Rootie! We ate it again for breakfast this morning with eggs and it was even better. I got your email, BTW – I just have to find a moment to get those lime leaves and then I’ll send them your way! How does one get these grocery bill-sponsored gigs?! Free sausages are 1000x more delicious and healthy than $5 sausages!